Each morning as the gate to fenced-in Gladys Park is unlocked, homeless men and women move in from wherever they have spent the night on downtown L.A.’s skid row. One group gathers near the portable bathroom stalls in the park; others take over a picnic shelter for their daily domino game. A few claim park benches to watch the activity — legal or otherwise — on Gladys Avenue. 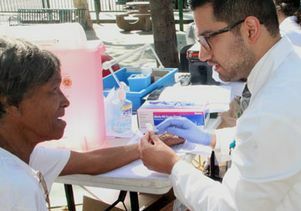 So the clinic has marshaled its staff, medical and nurse practitioner students from UCLA, volunteers and others to expand TB screening at the mission and to start outreach testing in other places where the homeless gather. “Our screening has gone up about 200 percent,” said Dr. Marfisee at the clinic, where patient load has ballooned from 8,000 to 11,000 annually over the last two years. TB has always been a concern at the mission, where the clinic does TB screening biweekly and it’s a requirement for anyone who seeks shelter there. “We were always good at it,” said Marfisee as 18 men waited to be tested in the mission’s cavernous dayroom. “We’ve really stepped it up. 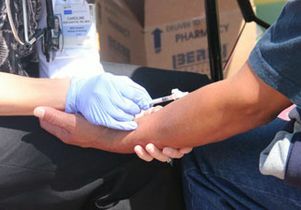 So anybody we don’t know or don’t recognize as having been screened, we go right up to them and say, ‘How about a TB test?’“ Employees, guests, volunteers, visitors — no one is overlooked. 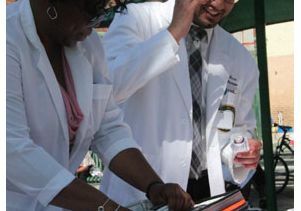 Helping the clinic increase its vigilance are medical students in a program jointly run by the UCLA Geffen School of Medicine and Drew University that specifically trains physicians to serve the homeless, poor and others in underserved communities. 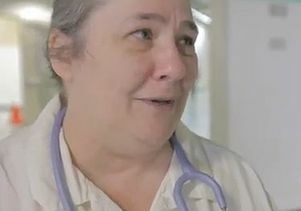 “It really does take a village when it comes to health care for the homeless, and that’s an understatement,” the physician said. The homeless are more at risk for TB than other populations because they often live in crowded conditions. This includes those living in shelters as well as those out on the streets where sidewalks are packed tight nightly. Marfisee noted that staying in a shelter doesn’t pose a higher risk than staying out on the street. The homeless are also vulnerable because their immune systems are weakened by poor nutrition, illness and stressful living situations. Back at Gladys Park, more than a dozen people straggled over for a shot given by UCLA-Drew University medical student Miguel Garcia, who graduated from UCLA’s medical school last week, and Caroline Dos Santos, an R.N. enrolled in UCLA’s nurse practitioner program. 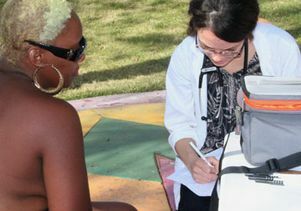 Y. Sherieda Stewart, a nurse practitioner from another downtown clinic who is studying for her doctorate and being supervised by Marfisee, runs the TB outreach events for the clinic. Sharon Beal, 68, got tested because she’s been in a hospital before and isn’t eager to return. “If I do have TB, where do I go? What do I do?” A positive TB screen doesn’t necessarily mean active TB, so those who test positive are sent for X-rays. For those diagnosed with active TB, a daily or biweekly regimen of pills may be called for. But getting people to be tested is the first step — not an easy one as Dos Santos and Stewart discovered as they tried to coax people to spare a few minutes to get tested and then to return in two days to have the results read. “Can you give me about 30 minutes? Because I’m getting high right now,” one man told Stewart as she tried to nudge him across the street to the park. Frustration comes with the territory, the nurse practitioner said. She’s been trying for weeks to get an organization nearby that attracts large numbers of transients to allow her to set up testing there, but no one has been willing to grant her request so far. The Rev. Andy Bales, CEO of the Union Rescue Mission, doesn’t need any convincing that the TB threat is serious. “I’m trying to keep everybody from panicking. 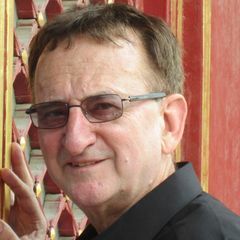 But it is a truly difficult disease to treat, especially if it’s concentrated in an area like skid row,” said Bales, who runs the 122-year-old mission. 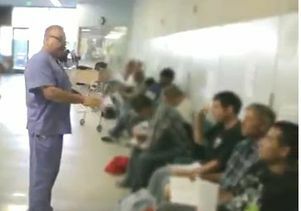 To learn more about the TB outbreak in skid row, see this FAQ from the Los Angeles County Department of Public Health.